Apply against 271 vacancies in Group B and C posts as notified by Staff Selection Commission (SSC), before 26 September. 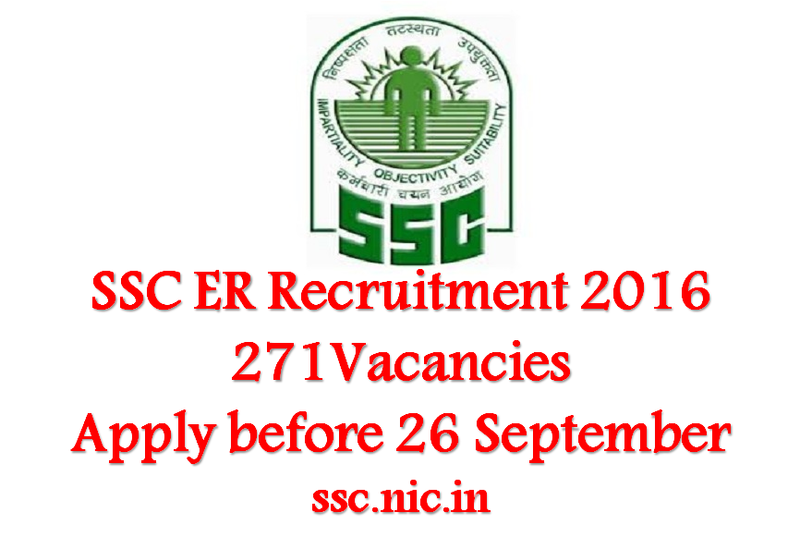 Staff Selection Commission Eastern Region (SSC (ER)) invited applications for recruitment to 271 Managerial posts. The candidates eligible for the post can apply through prescribed format on or before 26 September 2016. Eligibility for Assistant Archivist (General): Master’s Degree in History with an optional paper in Indian History of post-1750 period of a recognized University or equivalent. Diploma in Archival studies OR 2 years’ experience of Research in Modern Indian History in the period from 1750 onwards/teaching of Modern Indian History in a recognised educational institution/work in a Government Records Office. English as one of the subjects of study at degree level of a recognised University or equivalent. Eligibility for Data Processing Assistant: Degree of a recognized University with Science, Mathematics, Economics, Commerce, Statistics or equivalent. Diploma or Certificate in Computer Application from a Government recognized institution or knowledge of programming, system operations and systems analysis to be judged through suitable tests. Eligibility for Senior Instructor (Weaving): Degree in Textile Technology or Textile Engineering from a recognized University or Institute; (ii) Two years practical experience as an Instructor in handloom or textile weaving in a textile Institute or in a handloom production unit. OR (i) Three years Diploma in Textile Technology or Diploma in Handloom Technology or Diploma in Handloom and Textile Technology from a recognized University or Institute (ii) Four years practical experience as an Instructor in handloom or textile weaving in a textile Institute or in a handloom production unit. Eligibility for Senior Instructor (Weaving): (i) Degree in Textile Technology or Textile Engineering from a recognized University or Institute; (ii) Two years practical experience as an Instructor in handloom or textile weaving in a textile Institute or in a handloom production unit. OR (i) Three years Diploma in Textile Technology or Diploma in Handloom Technology or Diploma in Handloom and Textile Technology from a recognized University or Institute; (ii) Four years practical experience as an Instructor in handloom or textile weaving in a textile Institute or in a handloom production unit. Eligibility for Field Attendant (with Multi-Tasking): Matriculation or equivalent pass with science subjects from a recognized Board. Eligibility for Junior Engineer (Quality Assurance): i. Bachelor’s Degree in Science with Physics/Chemistry/Electronics/Computer Science from a recognised University. OR Diploma in Mechanical/Electrical/Electronics and Telecommunication/Instrumentation/ IT Engineering from a recognised University or State Board of Technical Education. ii. One year experience in Production or Development or Quality assurance in the relevant field from a recognised Organisation or Undertaking. Eligibility for Junior Engineer (Quality Assurance): i. Bachelor’s Degree in Science with Physics/Chemistry from a recognised University. OR Diploma in Mechanical Engineering from a recognised University or State Board of Technical Education. ii. One year experience in Production or Development or Quality assurance in the relevant field from a recognised Organisation or Undertaking. Eligibility for Junior Engineer (Quality Assurance): i. Bachelor’s Degree in science with one of the subjects at Graduation level viz. Physics, Chemistry from a recognised University or Diploma in Metallurgical Engineering from a recognised University or State Board of Technical Education. ii. One year practical experience in Quality Assurance/ Production/ Development/ Laboratory in the field of Metallurgy from a recognised Organisation or Undertaking. Eligibility for Research Assistant: Master’s Degree in Geography or Geology from a recognised university or equivalent. Eligibility for Scientific Assistant (Chemical): (i) Master’s Degree in Chemistry or Microbiology from a recognised University; or (ii) Bachelor of Engineering or Bachelor of Technology in Chemical Technology or Chemical Engineering from a recognised University or Institution with one year experience in the relevant field. Eligibility for Scientific Assistant (RPT) [Scientific Assistant (Rubber, Plastic & Textile)]: (i) Master’s Degree in Physics or Master’s Degree in Chemistry from a recognized University; or (ii) Bachelor of Engineering or Bachelor of Technology in Chemical Engineering or Textile Technology or Rubber Technology or Plastic Engineering or Ploymer and Rubber Technology or Chemical Technology from a recognized University or Institution with one year experience in the relevant field. Eligibility for Scientific Assistant (Mechanical): (i) Master’s Degree in Physics from a recognized University; or (ii) Bachelor of Engineering or Bachelor of Technology in Mechanical Engineering or Metallurgy from a recognized University or Institution with one year experience in the relevant field. Eligibility for Scientific Assistant (Civil): (i) Master’s Degree in Physics or Master’s Degree in Chemistry from a recognized University; Or (ii) Bachelor of Engineering or Bachelor of Technology in Chemical Engineering or Chemical Technology or Degree in Civil Engineering from a recognized University or institution with one year experience in the relevant field. Eligibility for Scientific Assistant (NDT): (i) Master’s Degree in Physics from a recognized University; or (ii) Bachelor of Engineering or Bachelor of Technology in Electrical Engineering or Mechanical Engineering or Metallurgy from a recognized University or Institution with one year experience in the relevant field. General Central Service, Group ‘B’, Non-Gazetted. Candidates are required to send their application at ssconline.nic.in/selectionposts along with application fee of Rs. 100/- (Rupees one Hundred only) through “SBI Net-Banking/Credit Cards/Debit Cards” or through SBI Challan. All Women candidates and candidates belonging to Scheduled Caste, Scheduled Tribe, Physically Handicapped and Ex-Servicemen, eligible for reservation, are exempted from paying application fee, as per extant government orders. After filling up the Application Form Online and after making payment of Examination Fee, candidate should take a print out of the Application Form, sign the same, affix a copy of the same photograph used for filling up online application and attach self-attested copies of Certificates/documents in support of age, Essential Qualifications, Experience, where it is prescribed as Essential Qualification, proof of Caste/Category issued by the Competent Authority and send to The Regional Director (ER) Staff Selection Commission Eastern Region Nizam Palace, 1st MSO Building, 8th Floor 234/4, A.J.C. Bose Road,Kolkata-700020. It should reach the Regional Office within ten days from the last date prescribed for payment of fee.